Because our cows are raised exclusively on grass, we use a system of pasture management called rotational grazing, where we move our cows into new pastures sequentially. It's sort of like moving them through a "buffet-line" of grass. This results in beneficial effects for the grass, the soil, and the microbes --- which ultimately is good for the cows, and therefore us too. By using this system of rotational grazing, the pastures are given a rest period, resulting in healthier grass, more organic matter, and more fertility. The microbes are a big part of the system. The manner in which we approach our farm is to look at the land holistically. This means considering the cows, the pasture, the forest, the microbes, the soil --- all the parts of the farm as being connected and working together. This approach allows us to work with nature, resulting in more biological resilience, increased agricultural production, and enhanced quality of life --- for the farm animals, and ultimately for us too. Using this approach to farm management, we facilitate healthy land, healthy animals and healthy people. 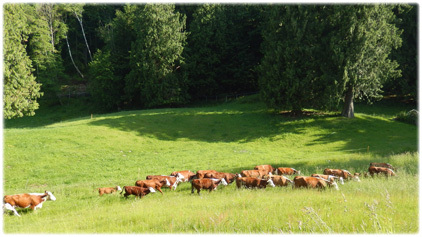 We use a system of pasture management known as rotational grazing.